UCCFS Round 3: Chicken Wings (1) vs Reuben Sandwich (5) – I Love It Spicy! Is this one going to be even close? Sure I love my Reuben, but against chicken wings in a Chilehead vote? This one might not be purdy. 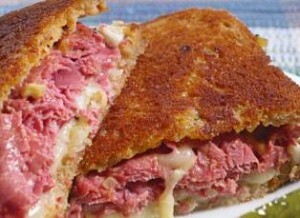 I will give it to the Reuben though, I was surprised that it survived to the Spicy 16. Beating the likes of Bologna & Cheese and Turkey w/ Stuffing & Gravy to get this far. Who knows, I might be wrong, two #1 seeds have fallen all ready. I do think Chicken Wings remains a huge favorite to win the whole Ultimate Chilehead Comfort Food Showdown. What do you think? Oh, there will be wings tomorrow. Go Ravens. Wings are always a hit. May have to go with tacos/nachos tomorrow though… How did you like the taco mix, FT? What are these wing things you speak of? Steelers vs. Vikings this Tuesday. It was close for a little while. The Reuben with a respectable showing.